Nothing changes a country more than a revolution. Sure, wars can ravage and destroy and change it for worse, but a revolution brings about new hope. Tunisia is a country that doesn’t necessarily dominate world headlines, but there has been some exciting things happening in the North African nation recently. In February 2014 they launched their new constitution which is a landmark moment especially in the area of women’s rights. The country, which was formerly part of the French empire, only achieved its independence in 1956, and with that it brought about laws that actually elevated women in society, under a code called the ‘Personal Status Code’. Back then this type of freedom for women was unheard of in the Arab world. The president at the time signed laws that decided on a minimum age of marriage for men (18) and women (15-not sure why it wasn’t 18…) forbade forced marriage, and polygamy. It was considered a feminist step up for Tunisian women. January 2014 saw a revolution in the country which demanded further change. 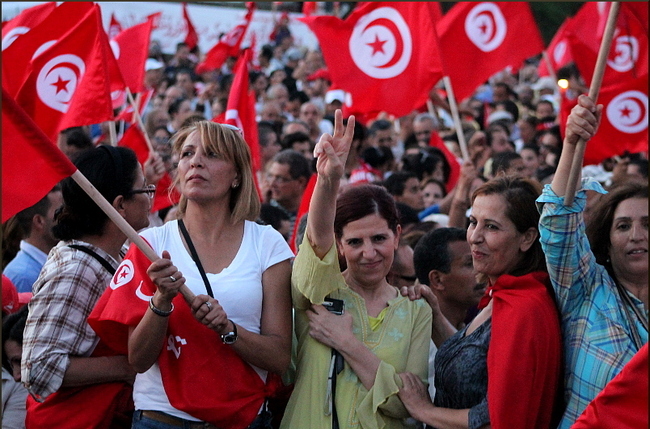 Citizens demanded a new constitution be drafted, and the issues were centered around women’s rights, social political and economic changes, and the role of Islam in Tunisia going forward. Today the country is operating under some major new laws which have officially made Tunisia the first country in the Arab world to ratify and include any form of women’s rights in its constitution. What a major breakthrough! It is also the first in the Arab world to give all Tunisians, both men and women, the right to be presidential candidates which leans more toward a democratic society than a patriarchy, or theocracy steeped in Islamic law. The key article on women’s rights states that ‘The State engages in protecting achievements in the field of women’s rights and in reinforcing them’ (Article 46). “Article 46 on equality guarantees parity between men and women in all elected assemblies, which is even more progressive considering this has not even been included in the constitutions of the majority of western countries,” said Hela Skhiri, National Programme Officer for UN Women in Tunisia. 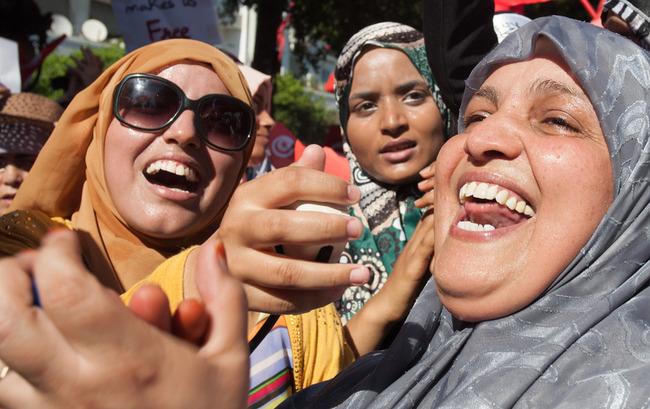 Tunisia’s new constitution not only allows for greater rights for women, but reinforces the laws brought about in 1956 after their independence. They are also making a crackdown on violence against women. “The state is obligated to act through public authorities by taking measures to eliminate all forms of violence against women. The way is therefore clear for the necessary legal reforms,” states the new constitution. Last year the Tunisian government adopted specific measures to combat gender-based violence through its National Action Plan for the Elimination of Violence Against Women initiative, as part of the United Nations Women’s COMMIT initiative. In the lead up to the vote, many women’s organizations and female-focused government groups marched, protested and made their voices heard in 2013 to ensure the new constitution didn’t revert to any old laws forbidding equality in all sectors. UN Women, the Ministry of Women and Family Affairs, and the Wilson Center-Global Women’s Leadership Initiative conducted a roundtable discussion about the issues they wanted to be reinforced and ratified in the new constitution. The group included 36 members from various government institutions who also shared their views on gender equality, human rights and non-discrimination laws. While the the representation of women in elected assemblies doesn’t yet apply to the government, it is a step in the right direction. The majority of the new rights are intended for citizens everywhere so that means the general public get to be part of the new democracy, not just a select few. Many world leaders are praising Tunisia for this new step forward, and hope that it will set a good example for other countries in the Arab world. Loban Jeribi, a scientist and member of the constituent assembly was one of the women campaigning for change since 2011. She says Article 46 is a revolution in itself, and is a very feminist statement. There are other women who claim they were able to have equal rights in society because they fought for it and didn’t back down, instead of waiting for a law to come about. “I am convinced that a woman must take her place by herself, through her own will and her competence,” said 60-year-old Fattouma Attia who was one of the first businesswomen in Tunisia. Meherzia Labidi, vice-president of the assembly from the governing Islamist Ennahda party and the most senior female politician in the chamber. 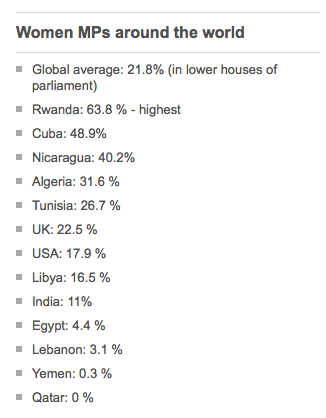 Ennahda has the highest number of female lawmakers – 41 out of 90. “We survived despotism and dictatorship due to female resistance, while the men were in exile or in prison,” says Ms Labidi. The majority of women think this new constitution is going to enable future generations to be able to live and work in freedom now that they have the opportunity to, instead of having to fight for it. This story is yet another example of women in the world rising to the challenge, and fighting for a better future. There are so many countries who are looking to nations such as Tunisia, and even Rwanda, in terms of how women play a key role in the structure of society. It has been proven time and time again that when women participate in all levels of government and leadership, a nation thrives. How can we use stories like this to spur us on in our everyday lives? At what point do we look at our roadblocks as launching pads into something revolutionary? 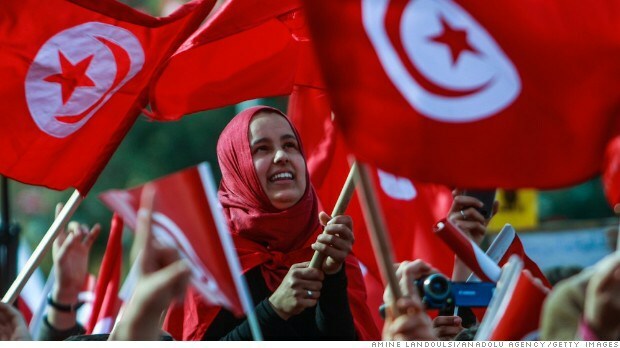 If there is anything Tunisia has proven, it is that anything is possible. Women are capable. Once we understand this, there is nothing that can stop us. “The State is obliged to act through public authorities by taking measures to eliminate all forms of violence against women. The way is therefore clear for the necessary legal reforms,” reiterated Ms. Ben Achour. Last year, the Tunisian Government undertook to adopt specific measures to combat gender-based violence through its National Action Plan for the Elimination of Violence against Women, as part of UN Women’s COMMIT initiative.